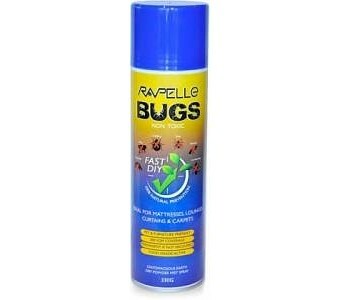 Rapelle Bugs is a food grade diatomaceous earth dry powder spray. Diatomaceous Earth is a poison free alternative to keeping bugs at bay. Non-Toxic, Family and Pet Friendly. An excellent choice for short term problems, and in long term prevention. Diatomaceous Earth has been used for many years in food storage and agriculture. It can easily be removed with a wet cloth but left undisturbed is permanent. Spray hard and soft surfaces. Ideal for mattresses, lounges, curtains, carpets, dog beds, laundry baskets, wardrobes, furniture, garage, lawn, roses, tomatoes, etc.